I’ve been trying to a better job with my bike locking since my brother’s bike got stolen last year. I think I have a pretty good sense for how thieves take advantage of bad locking practices, but what I’ve been confused when I see U-locks on the racks with no bikes. I visited Seattle last month and it seems these solo locks are everywhere. 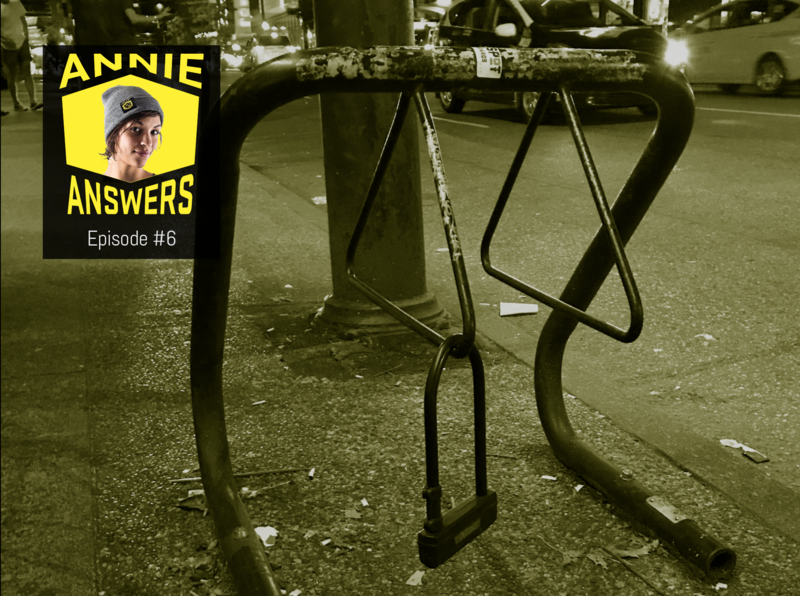 Is the ghost of Harry Houdini liberating bikes to impress us? I think I can shed light on this mystery for you. It’s very rare that a thief will take the time to pick a lock at the rack, so you’re likely not seeing trophies of liberated bikes. More likely, you are simply seeing “left behind” U-locks. They aren’t being left behind by thieves, they are left behind by their owners. Why, you ask? Often because they are commuters who use that rack daily for parking their bike while they are at work or at school. Back in the day, this was a protocol to “reserve” a preferred spot, an unwritten signal to cyclists to grab a different space if one is available. Early on, it also was a way to avoid transporting these new, heavy and awkward locks while riding. First, leaving a lock behind “at work” for most means that you probably don’t have that lock “at home.” This leaves your bike vulnerable where it is parked most frequently. As we see about 40% of bikes stolen from private residences, often unlocked, we always promote locking at home. Leaving your lock behind on the ride home doesn’t let you secure your bike if anything comes up during the commute. An emergency bio (or beer) stop can leave you in a situation with no lock to secure your ride. The weather can be unkind to locks when left outdoors for extended periods. Depending on the construction, moisture entering the lock cylinder or body can promote deterioration and potentially leave you in a situation where you either cannot lock your bike or you cannot unlock it when you need it. Thieves sometimes exploit this practice and may potentially target your bike as a result. A thief spotting a weak “left behind” lock or weakened rack might note it as a potential target. Why? Because the bike is likely to be parked unmonitored for extended periods during days. Another exploit involves thieves rendering the lock unusable – by say filling the cylinder with superglue or breaking off toothpicks. If you roll up to the office, late for a meeting and your lock doesn’t work, a likely remedy would be to buy a cheap cable lock and solve the problem with the U-lock later. Given modern U-locks that aren’t nearly as heavy and have good mounting options, I definitely recommend that the serious commuter always have a good lock on-hand when rolling. A great commuter lock is the ABUS 640 Mini, it comes with a frame mount and can even fit in a back jeans pocket.